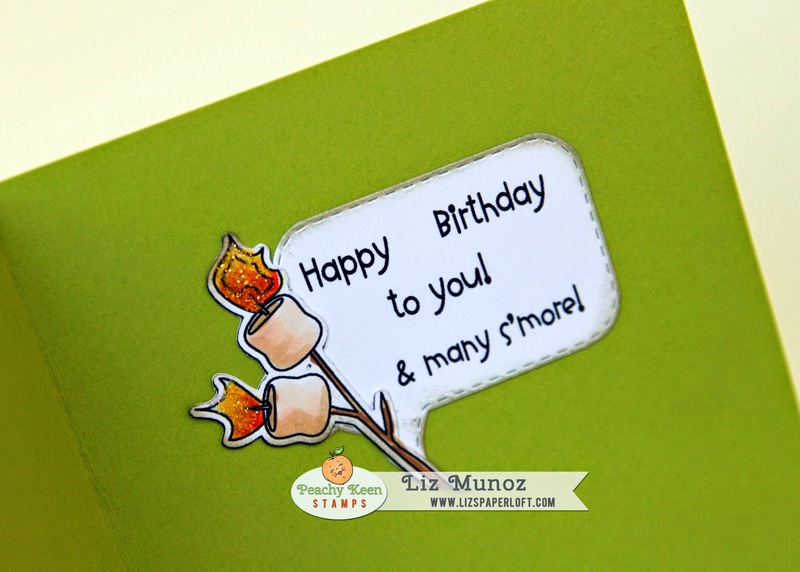 Liz's Paper Loft: PKS May Release Blog Hop ~ Happy Birthday! 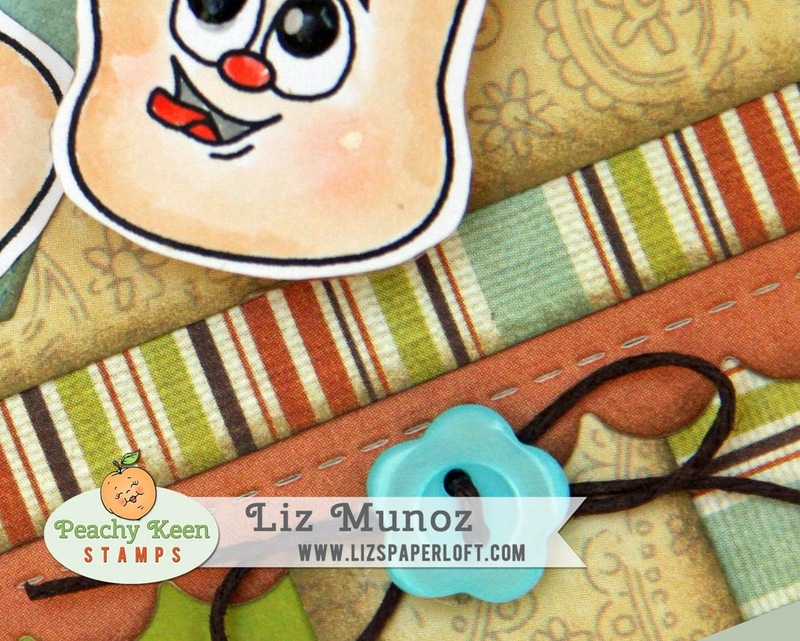 Welcome Friends to Peachy Keen Stamps May Release Blog Hop! The time has FINALLY arrived! We’re here and we’re ready to get hopping! We’ve shared four fabulous days of sneak peeks with you and we’ve been as exited as we could be for the time when we could show you EVERYTHING! If you’re a Stamp of the Month Club member then you’ve already had a look at the SOTM set. All of these perfectly coordinated stamps are NOW available in the Peachy Keen Shop, and even better, you can grab all your favorites from the May Release at 20% off through the 12th of May!! SWEET!! So let the hop begin...you should have arrived here from Brigit's blog, I just know she has one FABBIE project to share with you! If you just popped in to see me (thank you) you will want to head over to Peachy Keen's blog for the start. This way you won't miss a thing or a chance for fun prizes! We’ve seen some outstanding samples from our team so far, and tonight they have even more wonderful work to share for our blog hop. You’ll find the complete blog hop order below. We’re thrilled beyond belief that you could join us for this months release events and as our thank you, we want to offer you the chance for a wonderful prize! This month, we’re going to give away one $50 Gift Certificate to one lucky winner! All you need to do is leave a comment here and on our designer’s blogs. Tell us what you like about this release, and well give you one entry for each comment you leave. We’ll randomly choose a winner from all of the comments on all of the blogs and announce that winner here and on Facebook with our Peachy Keen Round-Up post on Friday, May 10th! Now it's time to head over to Amber's blog, where she will share will you an awesome creation! Amber Kroening – http://www.bellarosecards.com/ YOUR NEXT STOP! Are you curious about our Stamp of the Month Club and how it works? Thanks for joining us for our May event, and be looking for our May Linky Party to open on Friday! We want to see what YOU create with these new stamps and each creation you share gets you a chance to win a great prize!! Oh, and don’t forget about our challenges! You’ll find links to both the Linky Party and Challenges in our blog sidebar. Peace, Love & Creative Hugs! S'mores never looked so good and those marshmellows ain't bad either! Adorable and very cute. I love how you finished the inside too! Your card is awesome. Love the s'more and those little marshmallows. The faces are so so cute. Great job. LOVE your card Liz! Your coloring is just fantastic and I love the layout of the card itself! Fantastic job! So cute! 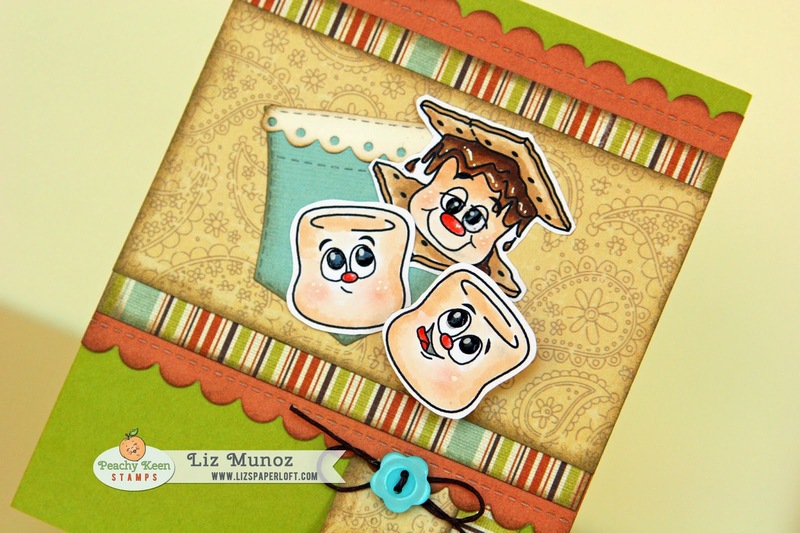 I love these adorable marshmallows:) Such a GREAT card Liz! Very creative! Love the way you did the inside too. 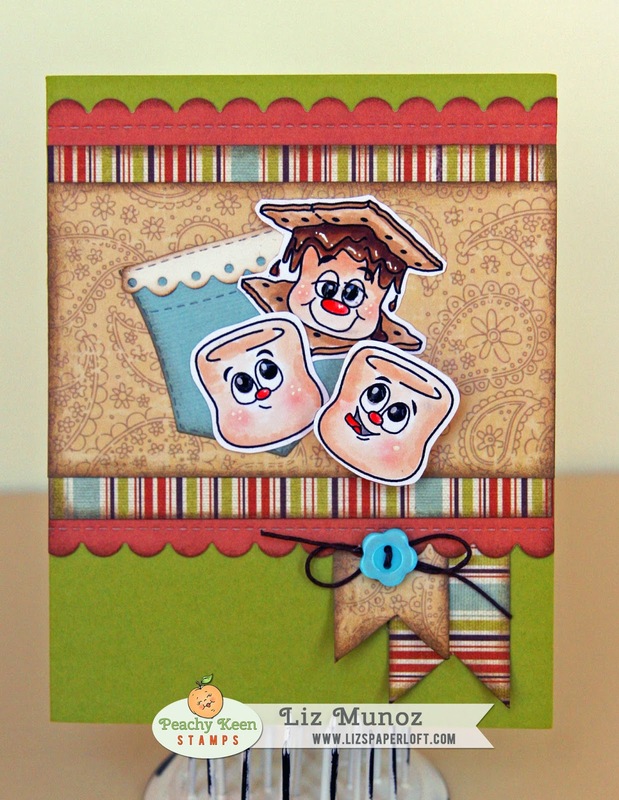 The card is so sweet and love the adorable face on the marshmallows. Thanks for sharing your sweet card. Love the smores and marshmallows. Such and adorable card love the faces!! They are a trio of cuteness!! Wonderful card!! The little marshmallows are too cute!! as for the sentiment..Super FUN! Oh Liz ~ this is simply ADORABLE! Again you sense of design and your coloring is seriously AMAZING! I LVOE how you sued the pocket too! FABULOUS papers!!! Love your great card and these super cute stamps. Thanks for sharing your great ideas with us today. Amazing card, such a precious use of those cute stamps! Very cute--I like the faces. These stamps made such a cute Birthday card. I like the pocket and edges. So pretty with the great coloring on the marshmallows. The marshmellows look good enough to eat. The inside of the card is as nice as the outside. Great job. This card is awesome! It made me giggle, it's so stinkin cute! I looooove the stamps from this set. The faces for the S'mores are soooo cute and the raccoon is my favourite. This is one of my most favourite sets yet. The designers did an awesome job. I can't wait until my stamps arrive, I have so many ideas for them. Thanks again for the fantastic designs and ideas. One of the cutest releases yet! My family is big-time into smores, so these would be FANTASTIC for me! So cute! So adorable, looks like that little marshmallow what's a taste of the chocolate!! How fun! Love the marshmallows! Super adorable card, Liz! I love those sweet faces and your design, coloring and every detail is PERFECT! Thank you so much!